The question for Senate Republicans is how long they will enable this attempt to throw one group of disaster victims under the bus. President Donald Trump has spent the last few weeks lying about Puerto Rico. This is to say nothing of the president’s behavior towards the island while in office. His infamous insults to the people of Puerto Rico over the past two years are well recorded — throwing paper towels at survivors, saying that the hurricane that devastated the Commonwealth was throwing the federal budget “a little out of whack,” complaining that Puerto Ricans “want everything done for them,” among other precious gems. Unfortunately, the president's bold face lies and recalcitrance against the island’s unmet needs are now holding up a bill that would fund critical disaster relief for several states and Puerto Rico. 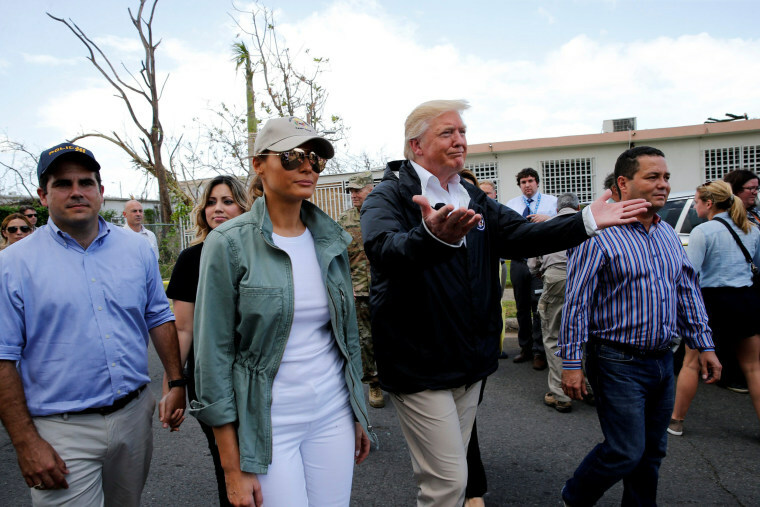 The president's bold face lies and recalcitrance against the island’s unmet needs are now holding up a bill that would fund critical disaster relief for several states and Puerto Rico. Here are the facts. Trump continues to falsely insist that Puerto Rico has received $91 billion in hurricane assistance funding. Even though FEMA and all independent experts agree that nowhere near that has even been appropriated by Congress ($41 billion has been approved, with only a fraction having been sent to the island), administration officials claim that the $91 billion is the amount that the federal government “expects” Puerto Rico will need over the next 50 years. That is like an insurance company telling the victim of a car crash it has paid the largest insurance claim in history — but instead of referring to the amount of money that has actually been approved for the specific claim, it announces an estimate the company expects will be needed in further car repairs for the next 50 years. It makes absolutely no sense. Beyond Trump’s lies, the big question for Senate Republicans now is how long will they continue to enable the president as he attempts to throw a particular set of disaster victims under the bus. Make no mistake, neither the president nor Congress can be allowed to pick winners and losers after natural disasters. Today it’s Puerto Rico, but tomorrow it might be California — or anywhere. We need a fully funded emergency spending bill to help everyone in all U.S. jurisdictions affected by natural disasters. That is supposed to be the American way and nothing short of this is acceptable. The president continues to insist — and Senate Republicans so far seem to agree — that he does not want “one more dollar” to go to the U.S. citizens of Puerto Rico. That cruelty and punishment is immoral. It’s divorced from the scale of devastation Hurricane Maria caused and the economic hamstrings long imposed on the island. And it makes no sense when we all know that it has taken years to recover from disasters like Hurricane Katrina and Hurricane Sandy. In fact, in 2007, two years after Katrina, Congress passed Public Law 110-28, which included an extension of the cost share waivers to Gulf Coast states impacted by Hurricanes Katrina, Wilma, Dennis and Rita. Puerto Rico, which faced two back-to-back category 5 hurricanes in 2017, deserves no less. I wish the president could look into Myrna Izquierdo’s eyes and tell her that no more funding is needed. Izquierdo runs a clinic for HIV-positive elderly patients in Toa Baja, Puerto Rico and she recently had to order nurses to reuse soiled adult diapers because the clinic depends on funding that expired earlier in March. This in turn has left 1.3 million Puerto Ricans struggling to pay for food and other basic staples. Or take the case of Amadita Jiménez Gutiérrez, who started to lose her emergency nutritional assistance in March, losing $200 a month, who now tells the Washington Post that she will “eat less” because of the funding cuts. Can you imagine the president of the United States telling Amadita that she doesn’t need these funds? Since when is putting food on the table — especially after the hurricane that caused the longest electricity blackout in modern U.S. history — “excessive and unnecessary,” as the Trump administration recently stated? A more relevant and time-sensitive question is, why are Senate Republicans tolerating this punishment? Since when is putting food on the table — especially after the hurricane that caused the longest electricity blackout in modern U.S. history — “excessive and unnecessary?" The slow and inefficient federal response to the twin hurricanes that hit Puerto Rico in 2017 showed that boricuas can pull themselves up by their own bootstraps. When the local government and FEMA were absent, neighbors helped neighbors to subsist, rebuild and survive. However, to truly recover and rebuild Puerto Rico, the federal government needs to fulfill its duty and help U.S. citizens in need. We need to create a Marshall Plan and provide Puerto Ricans with badly needed economic tools and policies to make the island more resilient and self-reliant. We are not begging for aid; we are demanding that the federal government meets its responsibility. After all, it is important to remember that Hurricane Maria exacerbated an already simmering financial and economic crisis that was due in large part to misguided federal policies towards the island that in turn helped to cause the human-made part of this perfect storm. If the insults, delays in the funding of life-saving programs, and other games continue to be played with the people of Puerto Rico, the five-million strong Puerto Rican diaspora in the U.S. will remember at the ballot box. Federico A. de Jesús is Principal of FDJ Solutions, and was the communications director for Hispanic Media for Nancy Pelosi, Harry Reid and Barack Obama. De Jesús is a former deputy director of the Puerto Rico Federal Affairs Administration and now also serves as a senior advisor for the Power 4 Puerto Rico Coalition.